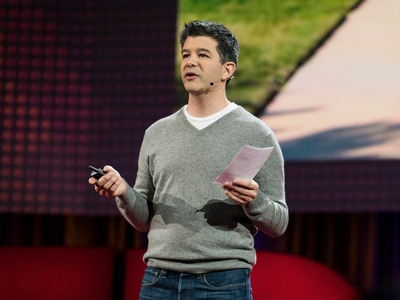 TED ConferenceUber CEO Travis Kalanick. 1. Apple’s big annual developer conference kicks off today. WWDC is expected to have announcements about Siri, Apple Music, iOS, and OS X, The Verge reports. 2. The all-American iPhone isn’t going to happen. Donald Trump wants Apple to build its smartphones entirely within the US, but analysis suggests that it isn’t possible. 3. Microsoft’s most ambitious bet is about to face a huge real-world test. The company is effectively merging Windows 10 and its Xbox consoles. 4. Salesforce was one of the most active VCs last year — but it has suddenly stopped making big bets on startups. The company’s quarterly filings show it has reined in its outside investments. 5. Security company Symantec is buying Blue Coat Systems for $4.7 billion (£3.3 billion). Blue Coat CEO Greg Clark is becoming chief exec of Symantec. 6. Bitcoin is surging. At nearly $700 (£493), the digital currency is at its highest in two years, City A.M. reports. 7. Leaked photos have revealed Microsoft’s New Xbox One S games console. According to The Verge, it is due to be announced formally at E3 this week. 8. British app-only bank Mondo is changing its name after a trademark dispute. CEO Tom Blomfield confirmed the imminent change to Business Insider. 9. Insurance firm China Life is funding ride-hailing app Didi Chuxing — just months after it invested in rival company Uber. TechCrunch reports it is financing Didi Chuxing to the tune of $600 million (£423 million). 10. A hack is going to kill someone within ten years, and it may even have already happened. That’s according to well-respected security expert Mikko Hypponen.